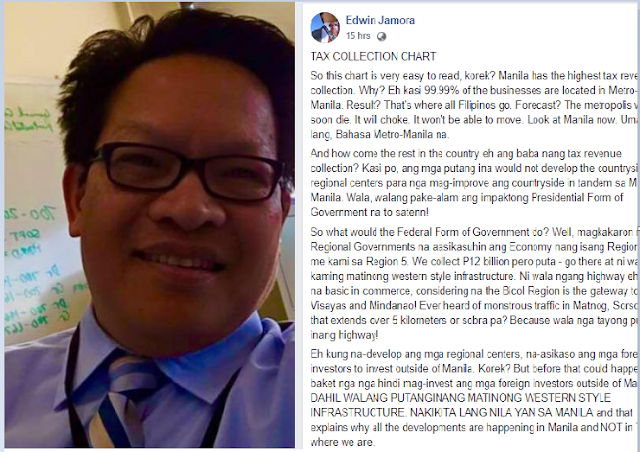 Home / Opinion / US-based blogger hits Presidential form of government: Bicol Region collects P12 B tax, pero ni walang highway! US-based blogger hits Presidential form of government: Bicol Region collects P12 B tax, pero ni walang highway! US-based blogger and accountant Edwin Jamora took Facebook as platform to express his analysis as to a Federal Form of Government could do in terms of regional development. Jamora said that 99.99% of businesses are located in Metro Manila, reason why, there was small collections of tax in other provinces. He also cited the main reason why foreign investors only focus in the capital city due to lack of western style infrastructure in the provinces. So, this chart is very easy to read, korek? Manila has the highest tax revenue collection. Why? Eh kasi 99.99% of the businesses are located in Metro-Manila. Result? That's where all Filipinos go. Forecast? The metropolis will soon die. It will choke. It won't be able to move. Look at Manila now. Umambon lang, Bahasa Metro-Manila na. So what would the Federal Form of Government do? Well, magkakaron nang Regional Governments na aasikasuhin ang Economy nang isang Region. Look me kami sa Region 5. We collect P12 billion pero puta - go there at ni wala kaming matinong western style infrastructure. Ni wala ngang highway eh! Basic na basic in commerce, considering na the Bicol Region is the gateway to the Visayas and Mindanao! Ever heard of monstrous traffic in Matnog, Sorsogon that extends over 5 kilometers or sobra pa? Because wala nga tayong putng inang highway! Eh kung na-develop ang mga regional centers, na-asikaso ang mga foreign investors to invest outside of Manila. Korek? But before that could happen, baket nga nga hindi mag-invest ang mga foreign investors outside of Manila? DAHIL WALANG PUTNGINANG MATINONG WESTERN STYLE INFRASTRUCTURE. NAKIKITA LANG NILA YAN SA MANILA and that explains why all the developments are happening in Manila and NOT in Talahib where we are.